This Craftsman-Style Bungalow features three spacious bedrooms and two and a half bathrooms on the first level with an additional bedroom, full bath and separate full kitchen on the second level. Having separate access to the upstairs this space can be used for RENTAL INCOME, an art studio, home-office, game room or guest quarters. 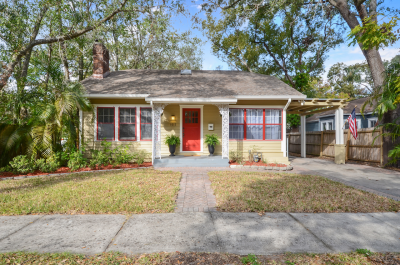 Upon entering this charming home you are greeted with beautifully refinished hardwood floors, freshly painted plaster walls, wide baseboards and a fireplace flanked by built-in bookshelves. The master suite contains a walk-in closet, large bathroom with a soaker tub and shower. Have you dreamed of having your own wine cellar? Here’s your chance! This home has a basement which could be converted into a wine cellar for your private collection! Outside you will find a private backyard, along with a large two car garage that could be used as a workshop or storage for all of your weekend toys! This rare find is a must see, schedule your showing today!